There are some things we must believe before we are able to make sense of anything at all. 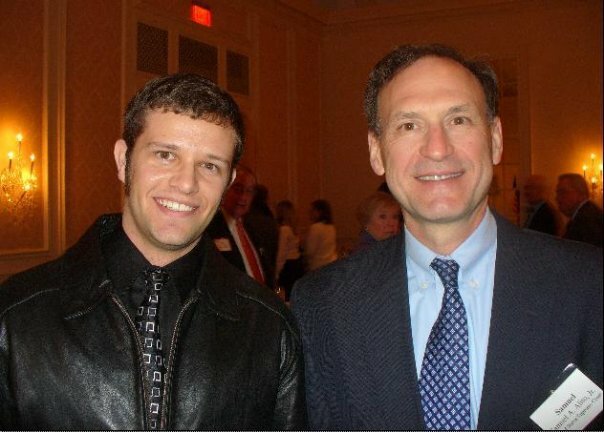 In the Spring of 2008, I had the privilege of having dinner with a few public figures right outside of Washington D.C. One such figure whom I had the privilege of dining with was U.S. Supreme Court Justice Samuel Alito (pictured above). The Supreme Court is considered the highest court in the land. One may appeal his or her case up to a higher court until the Supreme Court is reached. At that point, there is no higher court to appeal to. The Supreme Court is the highest judicial authority for the USA. There is no going above Supreme Court ruling. You can only appeal that far. It is the final authority. Everyone has things that he or she thinks are true. For example, you may think that there is a computer in front of you right now. Maybe you are not on a computer, but access the Internet through a mobile device. You may even be reading this after having printed it. None of that matters. The point is that you believe you are reading this right now. If I were to ask you about why you believe this, you would appeal to something else to explain your belief. Perhaps you would mention that you see the text in front of you. If you were pressed further, you might mention that you believe you see the text because you trust your senses to be reliable. You may be pushed for a further response and say that you think your mind is able to correctly interpret what your senses are telling it. So, if I were to ask you about C, you would appeal to B. If I wanted to know why you believed B, then you would appeal to A. This could go on for a long time, but it cannot go on forever. Everyone has to stop somewhere. Eventually you will reach your highest authority and be unable to go any further back, just like the situation with the Supreme Court. There is always a highest court of appeals. Some people take their highest court to be their own reason; their thought processes are said to be the final authority. Why do these people take reason to be their highest authority though? Is it because their reason tells them to? This, of course, is circular reasoning. This final authority, or highest court of appeals, is accepted on faith. Some people take their highest authority to be the senses. If the highest court of appeals is the senses, then there is nothing else to appeal to higher than the senses. The reliability of the senses will have to be accepted on faith. The same holds true for every final authority. There are some things we have to believe before we can make sense of anything else. Some people accept their reasoning on faith. Some people accept their senses on faith. There are other positions as well. Some people say that they reject all of these final authorities, which dumps them into the endless chasm of skepticism or subjectivism. These people claim to know nothing at all, or claim that they know whatever they feel like knowing. Both of these positions obviously have some very serious problems. The most significant problem with them is that people are able to function in the world and to make sense of things. This means that ultimately, people have a highest court of appeals, a final authority, a presupposition. As Christians we take as our presupposition the truth that God has revealed Himself to us through the Christ of Scripture. From this faith commitment we are able to derive an entire system of knowing other things. We are not just limited to what can be known in Scripture, but rather are able to take the principles taught in Scripture as a basis for knowing everything else we are able to know as well. Rejecting the Christian presupposition is placing oneself above God and results in foolishness. (Psalm 14.1; Proverbs 1.7) There are no successful objections to the Christian faith when it is properly understood and taken as a whole. Meanwhile, the rejection of Christian presuppositions results in self-defeating skepticism or subjectivism as the history of philosophy has adequately shown. How can people who claim that God does not exist still know things then? How can non-Christians make sense of things? What about very intelligent non-Christians? What about all the good things non-Christians have been able to bring about for society? What sort of answers could we possibly conjour up in response to these probing questions? To begin with, no one has denied that non-Christians know things, make sense of things, can be intelligent, and do things that are beneficial to society. In fact, our whole argument rests upon these things being true. No one is denying that non-Christians are capable of knowledge, rationality, intelligence, etc. However, we are denying that non-Christians are capable of these things upon their non-Christian presuppositions. The only reason people are able to still make sense of anything at all is because this is God’s world and we are God’s creatures. Those who claim to reject the existence of the Christian God (please note, this includes many more people than just “atheists”) are still able to function in the world because they borrow from Christian presuppositions. Our job as apologists is to point these things out. Christianity is the only system of thought which is able to render things intelligible upon its own presuppositions. This, I think, is the presuppositional understanding of things in a nutshell. Chris: There is no telos in naturalistic evolution. There is also no reason to think we can trust our reason. Nor is there reason to trust that scientists are being ethical and not just lying to us. Nor is there any reason to suppose the future will resemble the past. Tim: Great Chris, you would like to deny induction. The reason is utilitarian pragmatism. Chris: Excuse me? I never denied induction. Tim: Yes you did. You just said “there is no reason to suppose the future will resemble the past”. Chris: Within your view of things, Tim. Tim: You would like to deny induction in certain circumstances, is that better? Well, you just did. Chris: Wrong. I do not deny induction. You are forced to within your view. Tim: Okay great. So there is good reason to assume the future will operate similar to the past. Chris: And what is that? Tim: I’m not making that claim, Chris, I’m modifying the position I believe you are holding since you said you don’t deny induction. Tim: Kind of an interesting tangent…from homosexuality to induction. Chris: Not really since it is foundational. Are you Popperian? Tim: That’s a strange term, but I do agree with much of what Popper said. I’m not an expert on his views, I just covered them when studying philosophy of science. Chris: Not a strange term at all. Pretty common actually. Do you believe that science operates with induction or deduction? Tim: I don’t like name-based labels, when it’s the concepts that are important. Just like I assume you don’t call yourself a Newtonian, although I assume you recognize certain areas of physics. Science informally operates inductively, but formally operates deductively. Tim: I will explain. In informal language, scientists often talk about future applications of theories, etc., and assume that the universe operates uniformly. However, theories are based solely on deductive reasoning. So induction is assumed, but not necessary. Chris: So we cannot know that theories will apply again in the future? Chris: Then you are using hypothetico deductivism, not induction. Tim: Chris: If we knew they’d apply, they wouldn’t be theories. They’d be proofs. Chris: So you have no reason to think that the next time you type there will be characters on the screen. Yet you do. Which is irrational. Tim: Well, abductively I can reason that there will be characters, but I can’t prove it. I apply abductive reasoning. Chris: Abduction is just a reformulation of induction. And IBE as well. Tim: No it is not. Chris: It still assumes regularity. And I see no reason to do that in your view. Tim: a) No it doesn’t. b) Why? Chris: Okay, explain abductive reasoning to me. Tim: An inference to the best explanation is dependant on the preconceptions of the one making the inference. In other words, the best explanation could be one of non-uniformity. There’s no necessary “it must assume regularity” premise to abduction, although certainly the laws of logic would be appealed to. Chris: How do you determine what is the best explanation? Tim: Whichever one is best able to explain the observations, with the least number of undefined variables. Chris: But how do you determine which one is best able to? Tim: Well, by that standard I just typed. Chris: You just repeated the same thing. Tim: “Best” essentially means “efficient”. Repeated the same thing? No I didn’t. I used the word “best” twice, so you assume I’m appealing to a tautology, let me reword it. Tim: If the explanation was merely a repetition of the term, then it’s tautological. Chris: I would call it begging the question…but moving on. I think that to talk of a “best” explanation you must appeal to past experience. Tim: Well if that were true, Chris, it would be impossible to create any explanations since no human has an infinite regress of experiences. Chris: lol My point exactly! Uh…actually you would not need an infinite regress. Tim: Your points exactly? I’m disagreeing that an explanation requires experience. Chris: An IBE necessarily appeals to some assumption of regularity. Tim: Although, I guess one could argue that some experience (although unrelated) is necessary to operate intelligently, assuming they take a foundationalist view of epistemology. Chris: I’ll cite Oxford, Philosophy of Science on this as well as Chalmers, What Is this Thing Called Science? Tim: What have you won? Tim: Do you deny that ALL observations are made by our ability to perceive? Tim: Are you going to appeal to some mystical theory of scientific epistemology? Tim: Well, you seemed to cheer “I won” after I stated that science is subjective. Tim: Great, everyone is stating that Chris wins without stating how or why. Shall I invite some friends in the room to tell me that I won? Chris: I have an answer to the problem Tim, you are reduced to subjectivism. Chris: Dawkins would hate you. Chris: But anyway, I’m going to take a break. Tim: Chris: you have an answer? If I find a note at home on the table, I do not assume it is from a cat. It is from another human. That is the best explanation, and it is based on past experience. Hence Inference to Best Explanation relies on regularities in nature which a non-Christian cannot justify. God sustains the world, imposing order upon it which results in regularities that make inductive practices possible. The immutable God has decreed every event in time and we therefore act as rational creatures when we take this into account and assume temporal regularity for induction. Meanwhile, the unbeliever can assert things about the objective scientific status of homosexuality until he is blue in the face; he will end up in the kind of bind this fellow fell into. Expect much more on this subject at a much later date. The claim is often made that the existence of God cannot be proven. Some people wonder why so much time is wasted on attempting to prove the existence of God when this is the case. There are even a great number of believers who do not think the existence of God can be proven. I cannot help but think that this false notion is usually based upon the sad history of traditional proofs for the existence of God. Traditional proofs start with the would-be autonomous human and allegedly move to finally establish the existence of God. It is not surprising, then, to see that these proofs fail for a variety of reasons. Believers are sometimes brought to question their faith more through being presented with these proofs than they would have had they never heard such arguments. Presuppositional apologetics differ from traditional approaches to apologetics in many ways. Much unlike classical and evidentialist apologetics, what God thinks of things is taken into account first and foremost as opposed to what sinful humanity thinks of them. What humans have devised with respect to alleged proofs for the existence of God is of small import. Thus, when people make statements about our inability to prove the existence of God, we should dismiss what the creature has to say on the subject and turn immediately to what God has to say. What these objectors mean by “proof” may be tremendously different from what God means by it. If we seek to think through the objection that the existence of God cannot be proven utilizing the authority of Scripture rather than our own authority, we will ask if God has met His own standard of proof. The answer, of course, is that He has. It is shocking to me to hear Christians state that the existence of God cannot be proven when God Himself gives a plethora of information in His Word regarding how He views the evidences and proofs for His existence. Do we really think we know more than God on this subject? What a silly thought! The reason humanity is without excuse before Almighty God is because God has, according to His own Word, provided sufficient reason to believe in Him. Every person who enters the world not only sees the glory of God in every fact of existence, but also knows God for who He is. If you doubt this, then I would recommend spending some time with passages like Psalm 19 and Romans 1. Such passages changed my entire outlook on apologetics, and it is my prayer that they would do the same for you! The next time someone tells you that the existence of God cannot be proven, start questioning his or her bold assumption. Ask the individual how he or she came to this conclusion, what the individual means by “proof”, and whether or not the God of the Bible believes He has proven His own existence. To reject that God has given us sufficient evidence to prove His own existence is to call God a liar. We need only repeat what Scripture has to say in order to execute a sound biblical apologetic. Whether or not a person claims to be persuaded by the proof God provides of Himself is irrelevant to the truth that He has provided such proof. God’s view of things is the only one which matters. If we follow Scripture then we must understand that God has revealed Himself to everyone in such a way that it is ludicrous to claim that He does not exist. This ludicrousness is what the presuppositional apologist points out in the unbeliever’s worldview when he or she is faithful to the apologetic provided for us in God’s Word. That any human being might possess the ability to frustrate the will of God is one of many exceedingly arrogant doctrines taught in the Church today. Imagine the absurdity of worshipping a God who wills to do something but is unable to because His own creation stands in the way. Not only is this popular position on the relationship of God to created people unbiblical, but it would result in our inability to know anything if it were true. A child has no trouble understanding that there is nothing to fear with respect to the mudpie she just made. A creation has no power over its creator. A potter does what he wants to do with the clay. So it is with God. (Romans 9.20-21) God is the Creator. We are created. (Genesis 2.7) Scripture everywhere attests to this distinction. To go against the great truth of God’s sovereignty over all of His creation is to turn one’s understanding of things on its head. Nevertheless, a great number of allegedly orthodox believers are plagued with this sinful would-be role reversal. Eve was told that she would be like God. (Genesis 3.5) Eve thought that she might know some fact independently of God. Eve was deceived. (1 Timothy 2.14) Those who reject passages of Scripture which clearly teach that God is sovereign as God are likewise deceived. Our epistemology is revelational. We are able to have knowledge as we think God’s thoughts after Him. God made every fact what it is. God’s view of things is the only one which matters. For God, ‘all the facts are in’. Thus, we know a fact aright when our thoughts about that fact are in agreement with God’s thoughts. The false, unbiblical theology which states that all of God’s will is not accomplished places humanity at the center of things and involves facts which are not created facts. Since, in this view, the creature is taken to possess enough power to overcome the will of God; there are some facts which God has not created. These are facts God has no control over. These are facts which exist apart from God. For example, if evil does not come about in accordance with the will of God, then it exists only because humanity or some other creature has willed that it exist apart from God’s will. Evil is falsely believed to be out of the control of God. The will of the creature trumps that of its Creator. The pot has overpowered the Potter. Some attempt to weasel their way out of this absurdity by submitting that only the possibility of evil is according to the will of God. However, this still places evil in God’s plan, a conclusion which runs counter to the claims of those who wrongfully think we possess the ability to resist the sovereign will of God. Both the fact of evil and the fact of conversion are facts created and hence controlled by God. If it were any other way, then we could not know anything, for there would be facts which exist independent of God. If there were even one fact which might be known apart from God, then there is no reason to suppose that it could not be the same for other facts. Therefore the current infatuation with the idea of a weak and pathetic god who is subject to the will of his own creatures is fatal to our epistemological endeavors. Everything is rendered unintelligible through this false conception of God due to its inherent inconsistency with the idea of facts deriving their meaning from God. No fact can exist or be known apart from God. Thus a theology which rejects the complete sovereignty of God is wholly inadequate to deal with the challenges of worldly philosophy and is incompatible with presuppositional apologetics. Notice that this takes the form of a deductive argument, meaning that the conclusion “God does not exist” follows with necessity just as long as every one of the premises is true, and just as long as the form of the argument itself is valid (which in this case, it is). An important aspect of the argument above to recognize is the difference between premises a-c, and premise d. In presenting this argument, the unbeliever is stating premises a-c as hypotheticals; that is, according to the claims of Christianity, premises a-c are true. However, premise d is presented as fact. 9 times out of 10 the unbeliever does not say “the Bible claims that evil exists”, but rather “evil exists”. Let’s consider why this distinction matters. When presenting the argument above, the unbeliever is attempting to demonstrate the truth of all of his/her premises in order to demonstrate the conclusion is true. We, as believers, “give” premises a-c to the unbeliever, since those are the attributes of God found in the Bible. However, we don’t need to “give” premise d to the unbeliever, at least not at the outset. Please note that I am not claiming that we, as Christians, do not believe evil exists – we obviously do. However, as the burden is on the unbeliever to make their case, there is a real benefit in pressing them to demonstrate that premise d is true. After all, if a demonstration of the existence of evil is not forthcoming from the unbeliever, then they have failed to prove that God does not exist. The purpose in taking this tack is not to avoid the question of whether evil exists, but rather to press the unbeliever’s worldview to demonstrate their inability to make the argument in the first place. With that said, ask the unbeliever to demonstrate that evil exists. In doing so, be sure to clarify that they must offer an objective demonstration of this, if they wish to demonstrate their conclusion that God does not exist. This is exactly the point at which you can press the issue of worldviews, as the unbeliever does not have an objective, non-arbitrary set of presuppositions to use as a foundation to demonstrate that evil exists. Short of offering an objective foundation for the existence of evil, the best the unbeliever can do is turn to you and state “but don’t you believe evil exists?” This is exactly what you want them to ask! We will cover the second consideration next time around, and offer the Biblical answer to the problem. Even though I strongly disagree with C.S. Lewis in many areas, I find myself strongly attracted to his ability to display the truth in powerful and beautiful words all at once. I have pulled some quotes from the works of C.S. Lewis that I most certainly agree with and could never dream of improving upon. Some of these thoughts are representative of the presuppositional method of apologetics, which I cannot imagine anyone ascribing to C.S. Lewis. If the claims of this method of apologetics are true though, we should expect to find it resting at the bottom of apologists’ arguments. I pray that you will read closely, slowly, and savor every word. Afterall, “100 per cent of us die, and the percentage cannot be increased”. These are serious matters, and no one could make certain that we understood this more than Lewis could. Pointing out this implicit contradiction (that he wanted me to stop what I was doing as it was a waste of time, yet he really wanted me to keep doing it as he enjoyed it) really changes nothing in the overall discussion between us. However, pointing out such slip-ups helps keep us both on our toes. It never ceases to amaze me how difficult it is to reason about our presuppositions. The most natural approach to reasoning, I believe, is to rest upon our presuppositions blindly, without thinking about them at all. This is apparent to me time and time again in discussions I have with unbelievers. A rather enormous challenge in presuppositional apologetics, therefore, is getting your opponent to see that they have presuppositions, and that they must give an account for them. This is no easy task, believe me! The discussion I had two days ago was no exception. There is this discussion board that I literally “lived” on for the past 7 years, that I have only now begun to wean myself from. It hasn’t been all bad, actually – I learned a great deal about the beliefs of others, and about what I didn’t know about my own beliefs by spending time on that board. My skin grew thick from the constant abuse I took there, and my skills as an apologist grew greatly from what they were when I started out. Two days ago I ventured back to that board, and entered into a discussion about prayer. Never one to give even an inch to Christianity, this individual latched on to one of my comments and immediately challenged me to prove that “my god” answers prayer. Seeing an opportunity to challenge his presuppositions, I responded – and we were off! After a few exchanges, where he challenged me to prove the truth of the Bible, I said to him “I’m not trying to prove the authority of scripture – I am relying upon it“, realizing – hoping actually – that he would challenge me to account for what I was relying upon. Sure enough, he responded with “Well, before you can rely on it, you must prove it is valid“. After some more back and forth, he set the bar with the following – “The ONLY way to demonstrate that the bible is true is by hard evidence and facts“. This was the perfect lead-in to start to challenge him about his standard, which I proceeded to do. This was just what I was hoping for. I countered with “So your standard is validated by using the very thing your standard relies upon – evidence, reasoning, and the scientific method“, hoping that he would see the circular nature of his argument. He didn’t. It required another few rounds of back and forth before he finally realized he couldn’t simply assume that his standard was valid, and responded with “Okay then, how would you suggest demonstrating the validity of the scientific method?“. I will likely return to the board in the next day or so to respond, at which point I have no idea how far I will get with him. Regardless, this conversation got me thinking. There has to be a way to make presuppositionalism succinct. There has to be a way to get right to the heart of the matter, within just a few minutes, because there is so much time to spend after you reach that point. What is that “heart of the matter” of which I speak? Getting your opponent to realize that they are arguing from a standard – a worldview – that itself needs to be accounted for. This is one of my goals to tackle – to figure out a “formula” (for lack of a better word) to accomplish this. Well, the great people at eCamm came through and assisted me in repairing the corrupted audio from our last study recording. I have been able to mix and edit the audio, and now have it available for those who would like to listen.